A mum and daughter collaboration, Polkaknot all started when painter and macramé artist Suzana Brborovic sold her first product, a baby swing, to her close friend. Later, she taught her mum how to make a better version of the swing and with joint forces, Suszana opened her Etsy shop where she sells macramé pillows, wall hangings, planters, shelves and more. 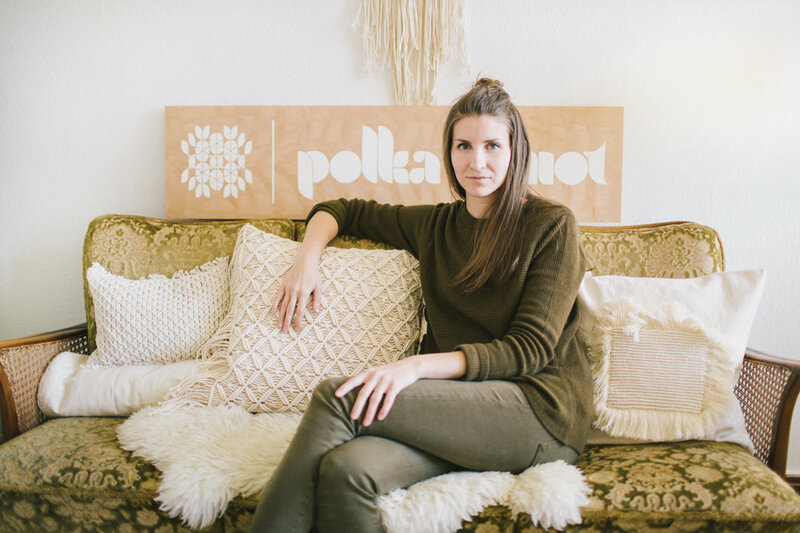 With the full support of her family, Polkaknot became a family business with the entire family using their individual strengths and creativity to contribute in all ways. We had a chat with Suzana on her journey towards turning her passion into a side time business and more. Early riser or night owl... Night owl since ages! I wish I could switch to being an early riser though. A song to get you into the creative groove... I love to listen to music when creating. At the moment, the song that brings me up every time is Around the World by Kings of Leon. 3 essentials we can find in your bag... A sketch book, wallet+keys and a bottle of water. 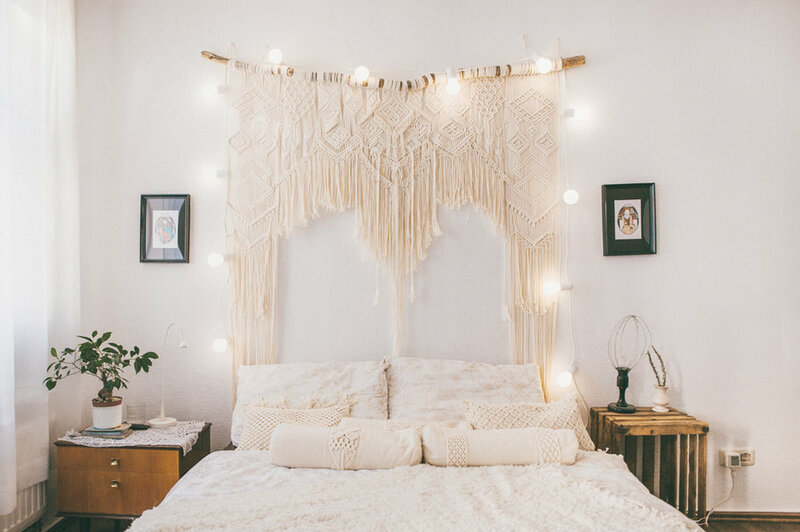 If you weren't an macramé artist, you would most probably be doing… My first profession is being a painter and then macramé artist… if I had to give up both, it would probably be connected with interior design. 1. 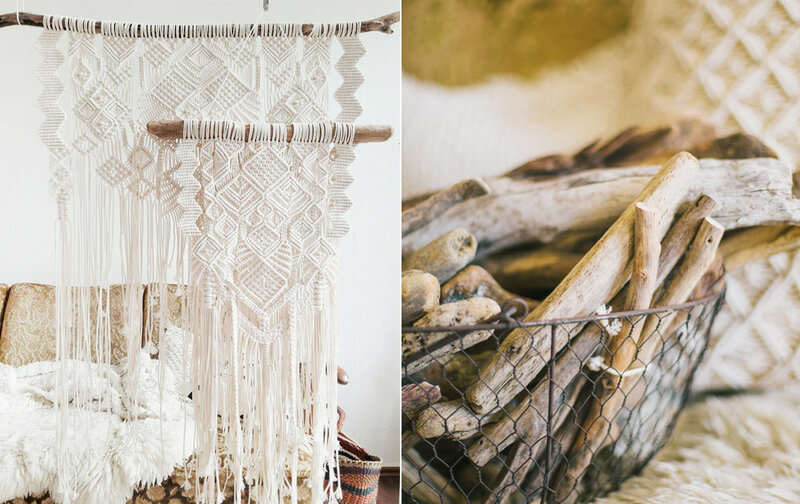 Tell us about your background and what led to you choosing macramé as a craft. I have always been creative since I can remember and knew that I wanted to be self-employed and in control of my time. As I studied art, it is my job to think creatively the whole day. My parents have always supported my decisions, even though to many being an artist meant that there is "no real future to it". I am so thankful for them and am giving my best to be good at things I love to do. Before I moved to Germany, I was very passionate about restoring old furniture, but only as a hobby (it’s where my love for vintage furniture comes from). I had all the tools and possibilities to pursue this interest. However, since my move to Germany, it became impossible to continue that. In my first year in Leipzig, I was only painting and needed an additional output/hobby I could do at home when I feel bored or uninspired to make art. I remember following some interior blogs and I saw this one post of a wood worker, Ariele Alasko. I was so inspired by her work and her home that I started checking out her Instagram every day. One time, she opened her space for a macramé workshop with Emily Katz and it is where I saw macramé after a really long time. I remembered macramé from my childhood days like those chunky 80's owls and bracelets that I made for myself and other kids. When we moved to our current apartment in August 2015, I said I want to give it a try! I watched some Youtube tutorials and when I saw how easy it was and what you can do with just two knots, I became obsessed. The best part is you don’t need special tools for it. Just some rope and wood, everything else comes from your imagination and of course the ability to tie knots. I don’t really see many connections between my art and macramé passion, except that it both relaxes me and offers tons of time to think about the world and then take the impressions into my art or craft. 2. What made you want to take your passion to the next level? From the beginning, I did a lot of funny attempts of wall-hangings and would always give them away for birthday presents etc. It was the best way to keep practising and explore all the different techniques and styles. My first serious product was a baby swing I did for a very good friend, who at the time just gave birth to a sweet boy. It took me 5 long days to figure the design and to get it right. The end product was adorable and I am proud to say that the swing is still in use..
At that time my mom was struggling with unemployment and I was thinking of ways on how I could help her. I decided to make a better design for the swing and bring different patterns to it. I taught my mom how to make them and a few months later I opened an Etsy shop with our first products. Soon followed were macramé pillows, wall hangings, plant hangers, shelves... Being professional also means taking care of social media, your web shop, answering a tons of questions and emails, deliveries to post offices, tracking packages, having problems with customers etc. I think once you start doing all that and you take it as part of the process, you become aware that it is not “just a hobby” anymore. 3. Tell us more about Polkaknot. My husband actually came up with the name Polkaknot :) To me, it represents the way of reviving old trends and retro designs. It is associated with the pattern name polka dot and since all the macramés come with certain patterns, I thought it was a perfect name for a brand. My brother designed the logo for it. So in a way Polkaknot is a family business driven by very creative and handy people in my family. Sometimes it’s challenging to work on our ideas since we live in different countries, but Skype has proved to be very helpful. At the moment, I run the business with my mom. She is much better with sewing and prefers structured work, like pillows and swings, because there are certain guides to follow. I on the other hand don’t like to repeat myself, and every single wall hanging I make is a unique design. This is also something I always explain to my customers, because often they want a design I already did. Keeping the design unique makes it so much more interesting for me. And it also adds to the value of my work in general. This is the reason I make such detailed pieces with very dense patterns. I guess it is just in my nature to create complicated things. 4. What kind of materials do you like to work with? Normally I only work with braided cotton rope in various thicknesses from 1.5 to 4 mm. But recently I was commissioned for a piece where I had to use mohair wool from South Africa and it was a very cool experience. I loved how soft it was... I also use driftwood that I collect in Slovenia by the cleanest rivers in Alps. I really like the unpredictable shape of it and what it can offer to macramé itself. I am a big fan of white and black and for now I am keeping my works in those colours, even though the trend of colourful macrame wall hangings has just kicked in. 5. What is your favourite piece of finished product and what inspired you to create it? My favourite piece I made is the big wall piece, hanging over my bed. It has a special sentimental value, since it was made as a backdrop for my wedding. It is such a beautiful memory of the best day in my life and waking up every morning underneath it is quite special... It took me so long to make it, but saying “I do” under it was definitely the best reason to make it in the first place. 6. How is the yarn scene like in Leipzig? Until now, I haven’t really noticed that there is a scene here. I am sure some people make macramés and weavings for their private pleasure, but otherwise I haven’t seen it much in shops or markets. 7. Is there any interesting or particularly memorable/interesting moment in your career as a professional maker? I remember how happy I was the time I sold my first wall hanging, because I never imagined I could earn some money with it. I am also very thankful to the Etsy community for sharing my work on Instagram. I guess there is not one moment in particular that would define my career, but it is the daily joy you receive from your craft. Reading beautiful comments and product reviews is really something that motivates you to keep developing and pushing your boundaries. 8. Advice for those wanting to make the switch into crafting full time? All I can say is to be patient and make your way through it by taking small steps. Taking a chance at crafting full time is really a big commitment. I know that since I have two self employed jobs where self organisation is the key to everything. It can be very hard sometimes, since the craft and art market is very unpredictable. It’s always good to have another kind of income or support, especially at the beginning.